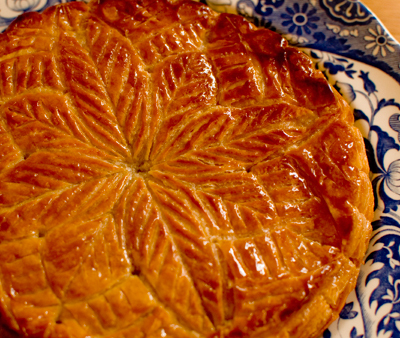 This year for Epithany, I made Galette des Rois from scratch again. Puff pastry & all. This time, leaf pattern. I think it looks country-esque & more like a pie compared to the swirly patterns on Parisian ones but I was wary of scoring those swirls as it needs to be so precise. Anyway, I’m quite pleased with the result, the puff pastry didn’t pull in strange angles & the galette came out almost perfectly circle! Phew! The ultimate tip when working with puff is PATIENCE. Firstly, I know it takes a looong time to make, but the waiting time in the fridge mustn’t be shortened by haste. And after you made it, it also needs a 12 hour rest in the fridge before using it/ rolling it out. It’s all about resting the gluten in the flour, otherwise the pastry will shrink upon baking. Then when rolling, if you think that the pastry is getting too soft, you have to put it back in the fridge to cool before approaching it again. – Never let that multitude layers of butter melt, because it’s the butter (actually, it’s the water content in the butter) who does the all-important puffing/ lifting, when it evaporates under the extreme oven heat. This ‘extreme oven heat’ is key too. It needs to be atleast 200 degrees centigrade. Anything less than that, the layers of flour will stick together because of poor evaporation & the whole thing won’t rise like the way you want it to. So yes, resting it in fridge & keeping it cool while working. And oh, when rolling out, roll to all directions from the middle outwards (never back & forth), & also turn it over & do a bit of rolling on that side too. Yes, phew! No picture of it cut in to a slice, I’m afraid! We’re gonna eat it later with everyone & try find my fève charms, Lyla & Roger, doing their once-a-year duty of hide & seek! Wow, I am very impressed! I love trying new challenges in the kitchen but puff pastry is sth I will probably never try! Good job on yours, it looks beautiful! Hi Tamami, wow…. your puff pastry looks awesome and I really like the leaf pattern. You ‘re a very talented baker. Thanks for sharing. *hugs* Have a nice day. Caroline, making puff pastry was also one of my last things to conquer!! But it’s not so difficult to make, just takes alot of time. – one day… One day I will try to write a recipe for it for the blog!! Cheers little chan!! It feels good to make! I also like making a cake especially for a certain date! Amelia, thank you! :) :) :) and the leaf pattern’s not so bad right?! Much easier to draw than those swirly curves! Hugs back to you! Congratulations! 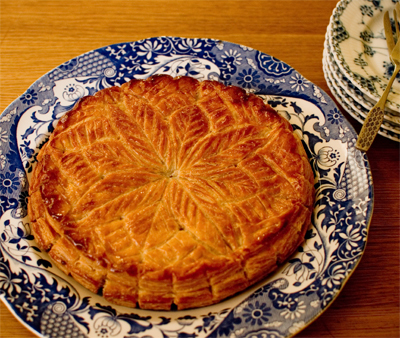 I really think that is the best Galette des Rois I have ever seen, I love the pattern on the top. Jeannette. Double-Yay! Cheers Rachel! :) Now I’m feeling really proud of my self! Lol. Well, there’s a French dessert called Pithivier which is EXACTLY the same (oh yeah, except for the pronounced scalloped edges on Pithivier), but just called differently & that’s not associated with a calendar date. It is sold all year round. So perhaps you can make a galette & call it Pithivier instead? Besides, for such a great dessert, I think it’ll be an awful wait if it’s a whole year, right? Petoskystone, he he :) :) :) That’s just so lovely, I’m all smiles! Thank you!!!!!!!! Not at all traditional, but it’s the one I’ll use from now on! Never left a message before although I really enjoy reading your blog Tamami. I am French and think your Galette looks excellent. The pattern is incredible ! Wish I could come to London on market day ! Your galette looks amazing. Did you do the leaf pattern by hand? Thank you for all the tips on working with puff pastry – I make it for special occasions so I don’t have much experience working with it, and I don’t want to ruin the fruit of my hard labour with som ebeginner’s mistake when I do! I left you a message in your 2009 blog. Silly me. haven’t left bloggs before so this is pretty new to me. Hope you receive my message and rsvp asap. Thanks. Hello Sally, unfortunately I have sold out on them all.